One of the most significant events between Return of the Jedi and The Force Awakens is the birth of Han and Leia’s son Ben. 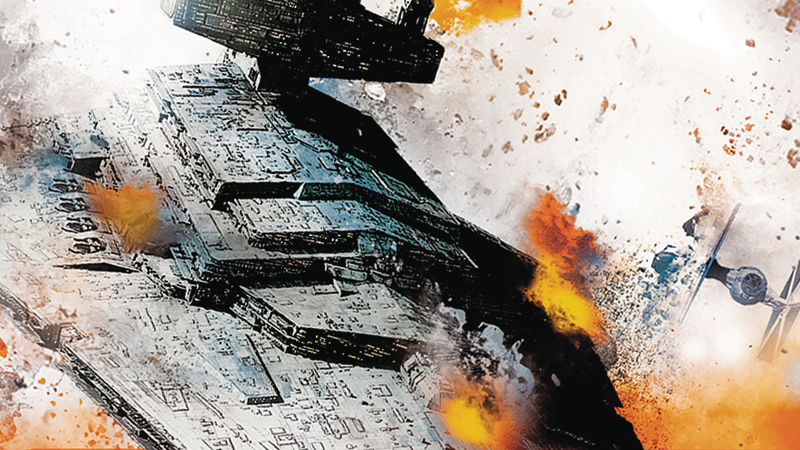 In this exclusive excerpt from Empire’s End, the final installment in Chuck Wendig’s Star Wars: Aftermath trilogy, it turns out Lando’s been a bit too busy to pay much attention to his old friends or their babies. The Aftermath novels have been chronicling the continued fall of the Empire and rise of the New Republic following the Emperor’s death. While they primarily follow a small group of rebels who hunt for missing Imperial officers (and occasionally Han Solo, when he goes missing), each book checks in with characters all over the galaxy; in Empire’s End, due out February 21, that includes Lando. In this excerpt, he recollects how he took back Cloud City, but also has the best idea for a baby gift in any galaxy. And here’s the excerpt. We hope Lando actually got baby Ben the gift. Or maybe that’s what turned him to the Dark Side? I’ll look into rehiring staff immediately. “Do that,” Lando says. Then he thrusts up a finger. “Ah. But make sure we’re hiring some refugees, will you?” The galaxy’s like a cup that’s been knocked over, and now everything’s spilling out. Whole worlds have been displaced by the war. Lando can’t let Cloud City turn from being a city of luxury to being a tent city of expats and evacuees, but he can damn sure give those people jobs. That’s his fa­vorite kind of arrangement: the kind where everybody gets something for their trouble. They win. He wins. The ideal for how everything should work. Cloud City was always that, for Calrissian. It was a respite—a ref­uge from the Empire while at the same time not existing to spite the Empire, either. He thought, Hey, everybody can be happy, baby. The Empire didn’t have to care. The rebels didn’t need to care. Cloud City could hang in the air above Bespin, separate from all the chaos, from all the strife. Come here, taste a little luxury. Meanwhile, he could mine the Tibanna gas, sell it to whatever starship manufacturer wanted it (the stuff was perfect for making hyperdrives, because with Tibanna, a little went a long way). Meanwhile, Lando could sit back, have a drink, roll some dice, find a lady or three. Yeah. It didn’t work out that way. He knows now: In a war like this one, you don’t get to be in the middle. You can’t play both sides. He’d lived his whole life shooting right down the middle, never taking up a cause except the one meant to support his own empty pockets. Those days are over and so is his love of sweet neutrality. When Vader came here, everything changed. He lost Han, for a time. He lost Lobot and Cloud City. He lost nearly everything. But he gained a little perspective. And he picked a damn side. Because sometimes, you want to win, you gotta bet big. You gotta put your stack of chits in one place. It paid off. The Empire is gone. And now he’s a hero of the Rebel­lion (and oh, you can be sure he used that to con more than his fair share of free drinks, not to mention the attention of beautiful admir­ers). But all he wants is his city back. After Endor, he thought he would just be able to sweep in here like a handsome king retaking his throne in the sky—but then that son-of-a-slug Governor Adelhard formed the Iron Blockade. He kept the people here trapped not only by a well-organized Imperial remnant, but also by a grand lie: that Palpatine was not dead. And Lando knows that old shriveled cenobite is dead—because he’s the one who took out the Death Star’s reactor core. And because Luke said the monster was dead. Can you believe it? Palpatine and Vader. Both gone. Two scourges, scoured from the galaxy. Suddenly he had a second war to fight. Here he thought the Empire was done for and Cloud City was once again his. What an eager fool. Nothing’s ever that simple, is it? It took months and months. He had to stage an uprising. Had to interface with Lobot on the inside. Had to cash in favors with a handful of scoundrels—like Kars Tal-Korla, that pirate. All because the New Republic wouldn’t commit a military ac­tion to retaking the city. He respects it, he understands it, and Leia put it best when she said, “The Rebellion was easy, Lando. Governing’s harder.” The chancellor was just trying to hold on to whatever advan­tage she had—and then with the Liberation Day attack on Chand­rila . . .
Well. All that is over and done. No need to dwell. Cloud City is his once again. Lando starved out Adelhard. Most of the Imperials surrendered. It’s over. Thank the lucky stars. He steps forward into the Casino level, and he and Lobot aren’t alone. He’s got a ragtag force with him: some of his Wing Guard secu­rity forces, but some New Republic soldiers, too. It’s just enough to perform cleanup on those who linger behind, clinging to the illusion they can still win this thing. Yes. In the Bolo Tanga room. From the book STAR WARS: AFTERMATH: EMPIRE’S END by Chuck Wendig. Copyright © 2017 by Lucasfilm Ltd. Reprinted by arrangement with Del Rey Books, an imprint of Random House, a division of Penguin Random House LLC. All rights reserved.